The Optus Centre is located at 367 Collins Street, Melbourne. Standing 153 metres tall, it incorporates 34 floors, and was completed in 1975. The main foyer, and mezzanine areas are home to cafes and a branch of the Commonwealth Bank. 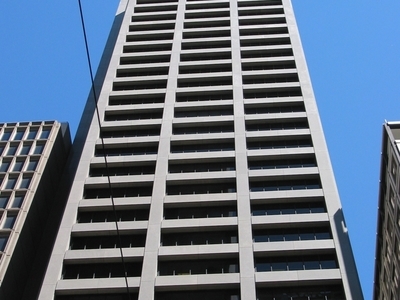 Originally an office building for the Commonwealth Bank, the tower was the tallest building in Melbourne when completed, eclipsing the former BHP House by 1 metre. It was overtaken two years later with the completion of the 52-storey Nauru House. The building is also home to a breeding pair of Peregrine Falcons. During the breeding season, a display is set up in the foyer, to enable the public to view the nest as the Young hatch. Here's the our members favorite photos of "Skyscrapers in Melbourne". Upload your photo of Optus Centre!